a western character that had flopped a few years earlier. A little revamping (i.e., re-invention from the ground up), and The Ghost Rider fit right in. Unlike the old character (and an older version yet, from another publisher), this Ghost Rider rode a motorcycle instead of a horse. And he wasn't just a guy with a bunch of scary gimmicks, but a real supernatural being, with a flaming skull where his head ought to be — the kind that would have had a hard time making it in comic books before 1971, when The Comics Code Authority lightened up a little about how horrific an ongoing character was allowed to be. He first appeared in Marvel Spotlight #5 (August, 1972), in a story written by Roy Thomas (Arak Son of Thunder, Infinity Inc.) and drawn by Mike Ploog (Weirdworld, Monster of Frankenstein). He moved out into his own title with a September, 1973 cover date. Johnny Blaze was an ordinary (tho highly skilled) stunt rider, who had dealings with Mephisto (a Satan-like recurring Marvel villain), as a result of which he found himself fused with a soul-eating demon named Zarathos. This caused him to undergo frequent transformations into The Ghost Rider, who would then tear through the city on a flaming motorcycle, hurling balls of fire wherever he pleased. At first, this happened only at night, which is also when he looked his best. Later, he'd transform whenever in the presence of evil; and later yet, he became able to control the transformations. 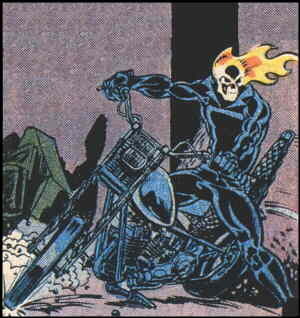 Blaze and Zarathos were both part of the Ghost Rider persona, but which was ascendant seemed to depend on the needs of the story. The superheroes didn't yield to the incoming genre as expected, but instead more-or-less absorbed it. The first inkling that The Ghost Rider and his ilk were becoming just another corner of the Marvel Universe came in mid-decade, when he got together with Man Thing, The Werewolf and Morbius the Living Vampire to form The Legion of Monsters. This stalwart team made only one appearance (Marvel Premiere #28, February, 1975), and with good reason — it must have been next to impossible for a writer to come up with an excuse for getting them together. Eight months later, he was in a perfectly ordinary (and slightly less short-lived) group, The Champions, along with The Black Widow, the Marvel version of Hercules, The Angel and Iceman (the last two being former X-Men). This Ghost Rider lasted longer than the two western versions put together, ending in its 81st issue (June, 1983). Unlike most canceled series, it had an actual ending. In the final issue, Blaze succeeded in getting rid of Zarathos, penning him up in a bottle where he'll spend eternity battling his arch-enemy, an immortal shaman called Centurius. And Johnny Blaze went back to being an ordinary (tho highly skilled) stunt rider. Yet another character called The Ghost Rider has come and gone since then, but when today's comic book readers think of The Ghost Rider, it's usually Johnny Blaze that comes to mind. So in 2001, when Marvel revived the concept yet again, he was the one they put in the hot seat. He'll also be The Ghost Rider in the movie version. Just as Marvel characters tend not to die permanently, they also tend not to get rid of their curses for good. Text ©2002-10 Donald D. Markstein. Art © Marvel Comics.